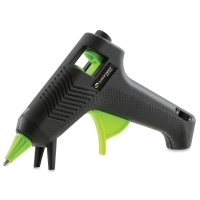 Compact, lightweight, and easy to handle, Surebonder Mini-Trigger Glue Guns are great for classroom use! Choose from three models — High Temperature, Low Temperature, and Dual Temperature. All three are equipped with a built-in stand that keeps the tip safely elevated while in use. 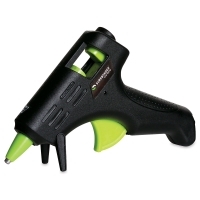 Surebonder Mini-Trigger Glue Guns use mini 5/16" diameter glue sticks (sold separately). Mini-Trigger Gun, Low Temperature — Operating at 230°F, this glue gun is great for bonding delicate materials such as fabric, ribbon, and other embellishments. It's also a safe choice for kids' projects at home and school. 10 Watt. Mini-Trigger Gun, High Temperature — Perfect for bonding heavy materials such as metals, plastics, and ceramics, the operating temperature of this glue gun is 300°F. 10 Watt. Mini-Trigger Gun, Dual Temperature — This glue gun can operate at either 300°F or 230°F. Select the higher temperature for bonding metals, plastics, and ceramics and the lower temperature for delicate materials such as fabric and ribbon. 10 Watt.